THAILAND | Chiang Mai Eat Is! 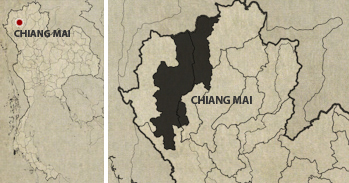 Last summer, I visited Chiang Mai for the second time. During my first time here, most of the dishes I’ve sampled were mostly from upscale restaurants and hotels. It was a rare treat (once!) that I got to taste what street food was like in the city. On this latest visit, I vowed to see the other side of the coin. 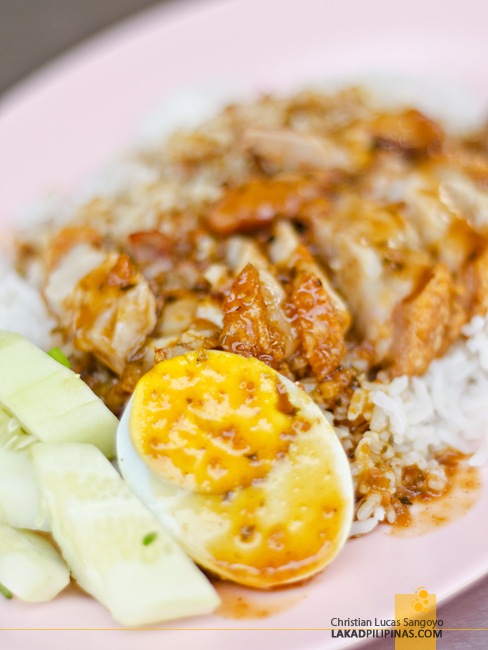 I wanted to explore and brave what Chiang Mai has to offer when it comes to street food. KUAYTIAO LAD NA, LOOKS YUMMY EH? 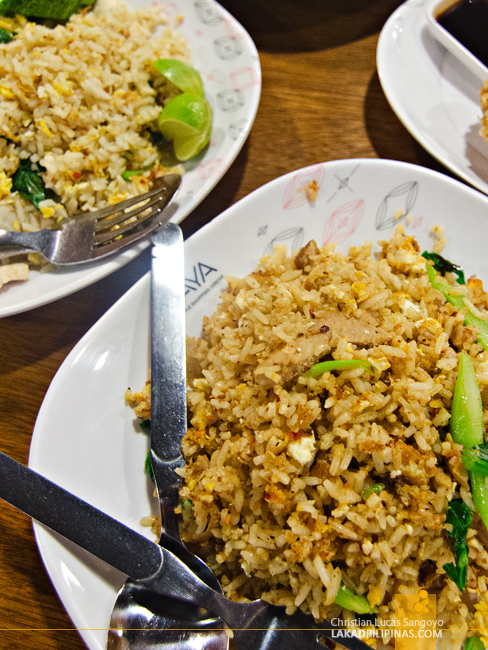 Even if we were still dizzy and reeling from the three-hour ride from Pai, a town northwest of Chiang Mai, the first thing we looked for upon arriving was food. 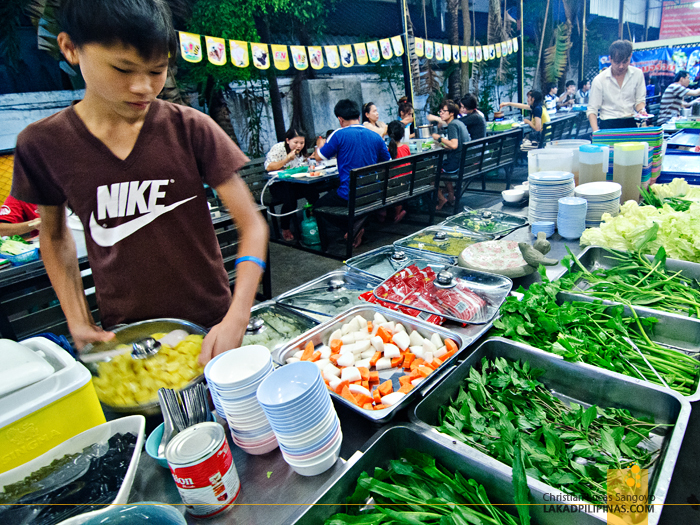 Cheap, real to goodness, street food. B and I, our friends from the city, knows just the right place for our grumbling tummies. 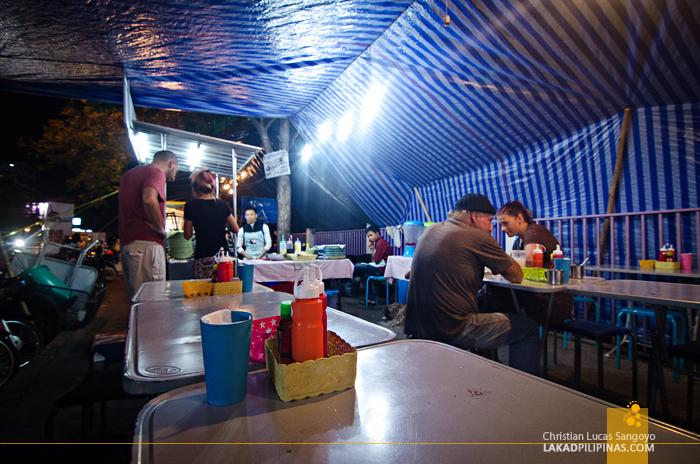 Chiang Mai University’s sidewalk, along Suthep Road, transforms into a food haven once night descends. All along the avenue, temporary stalls set up tables and plastic chairs for diners looking for an affordable evening meal. 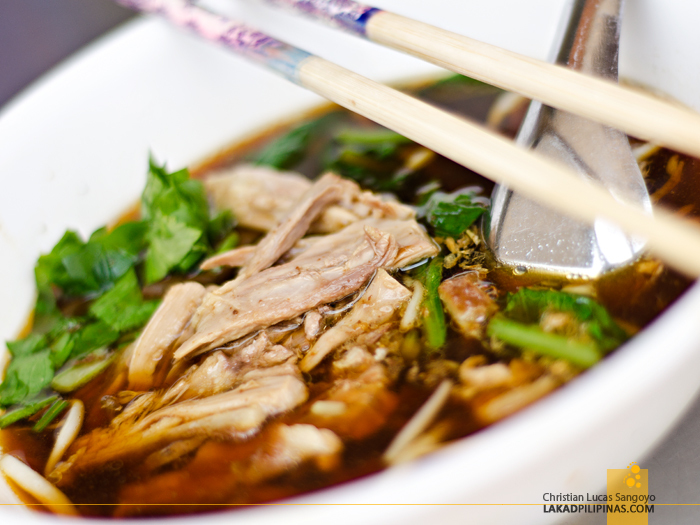 The whole stretch has all the popular Thai food you can think of, from pad thai to rice meals, and even Japanese ramen! We don’t want no ramen, of course, we’ll have that when we visit Japan. Right now, what we wanted was hot and spicy Thai food. 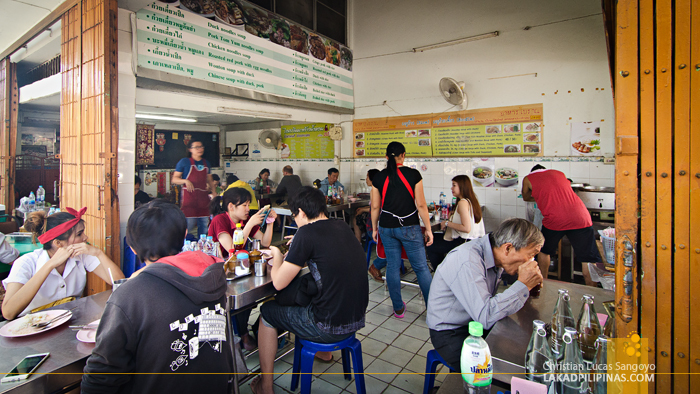 From two different stalls, we ordered a big plate of crispy pork with rice or khao mu krop (35.00 Baht) and Thai-style wide noodles in thick sauce or kuaytiao lad na (35.00 Baht). That’s less than Php50.00 each for a full meal! The noodles looked good on first impression; creamy soup, soft meat, some greens. Unfortunately, I didn’t know that they would be putting in wide noodles instead of the usual thin ones, and I’m not a big fan of those. That ruined it for me. The crispy pork rice, on the other hand looked divine. It might even pass off as a Filipino tapsilog of sorts, if not for the eggs being hard-boiled instead of fried, and the sticky red sauce that they slather all over. It looked spicy, but it was quite mild. I wished we ordered two servings and did away with the noodles. 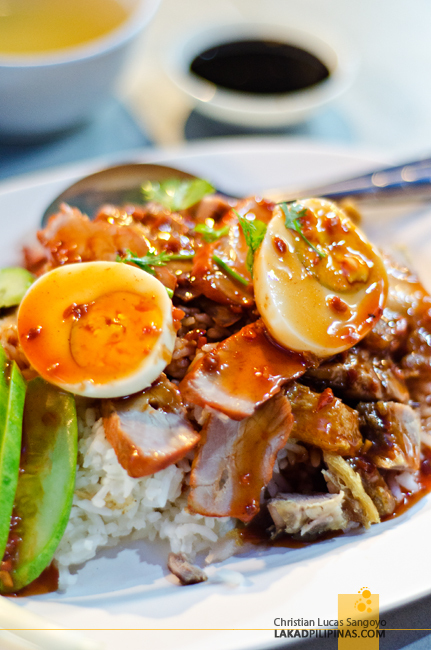 The next day, I was rarin’ to go back to a hole-in-the-wall eatery we visited in Chiang Mai a year ago. 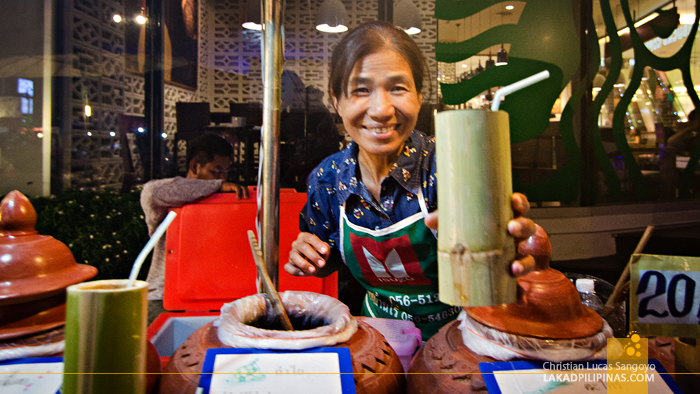 The place was located on the street across the Lanna Folklife Museum. My excitement turned to dismay though as we found it closed at the time. Good thing there were a couple of restaurants serving almost the same dishes beside it. The vibe was almost the same as with the previous restaurant I tried; tiled floors, plain white walls and simple nondescript furnishing. We wasted no time and ordered our lunch. Their menu, besides having English translations, also has photos to accompany it. Perfect. 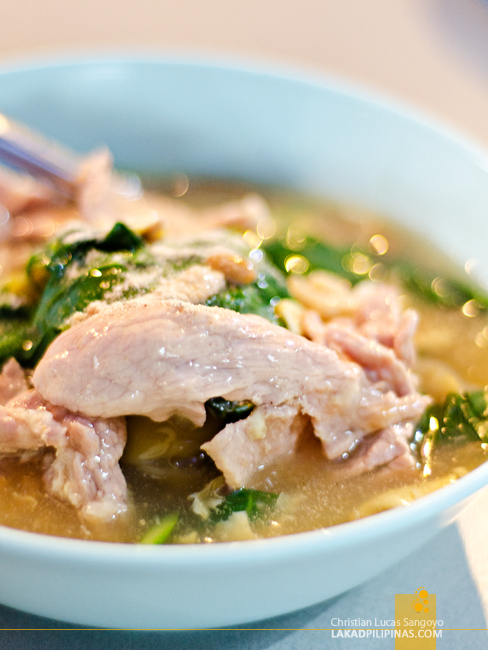 My friend asked for crispy pork with rice (60.00 Baht) again, and I settled for their Chinese soup with duck, chicken and pork or kuaytiaw pet something (50.00 Baht). Forgive the translation, haha. 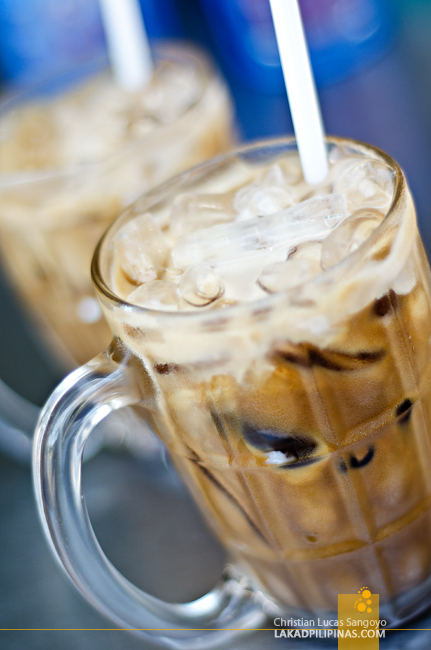 Since it was terribly hot in Chiang Mai, we asked for two glasses of iced coffee (20.00 Baht) to go with our meal. The coffee was heavenly. The mix of bitterness and sweet milk with slivers of ice was just perfect for the unendurable noontime heat. I was almost halfway through it when our lunch arrived. Again, the crispy pork with rice did not disappoint. How can it, it almost looks and taste like pork liempo. On my end, the dark-colored soup I ordered was sprinkled with bean sprouts, some leafy veggies and meaty portions, it was pretty good too. Forget about the heat, I’m sweating buckets, but I added a few sprinkling of chilis to make it even better. NOW, WHAT ARE THOSE THINGS? I’m really not one to go to malls, especially on trips. But when the second installation of The Avengers is showing, one can’t simply not go. And while waiting for the film to start, we decided on having our dinner at Chiang Mai’s Maya mall’s food court. Located on the basement of Maya mall, the vibe was surprisingly very street-like. The stalls were also selling what we see food vendors hawking along the streets of Thailand, and at the same prices to boot! Well, except we weren’t sweating buckets; it’s air-conditioned, everything was very orderly, and most probably, the food are also much more hygienic. Since our Chiang Mai buddies were treating us to the movie later, we decided to spend a bit more than the usual. 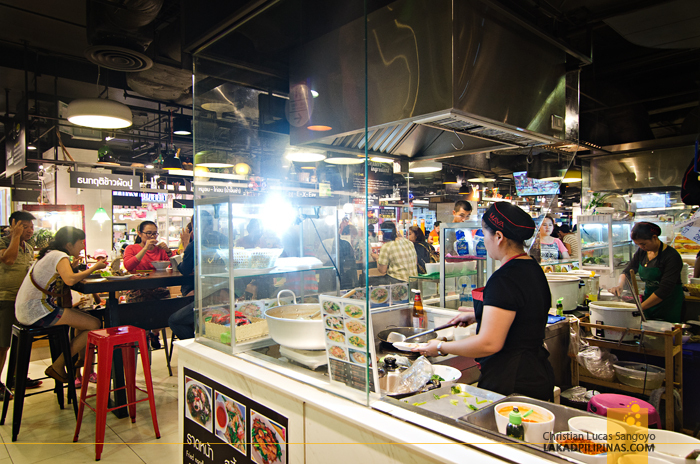 From different “hawkers” along the food court, we got Thai spiced tofu (25.00 Baht), Thai fried fish cake or tod mun pla (5.00 Baht per piece), fried rice with pork or kao pat moo (50.00 Baht), fried rice with chicken or kao pat gai (40.00 Baht) and, gasp, fried chicken (35.00 Baht)! Most of the dishes were on the spicy side, which I really dig. The tofu was the best one for me though, even outscoring the fried chicken which we were craving for the longest time. Now, only if they have a gravy, I might’ve scored them a little differently. 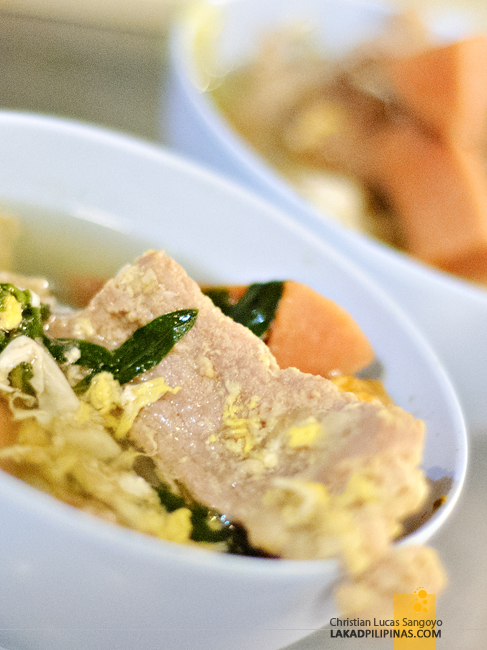 A hot-pot was something I totally didn’t expect from Thailand. But they do have a few places to have it in the city. 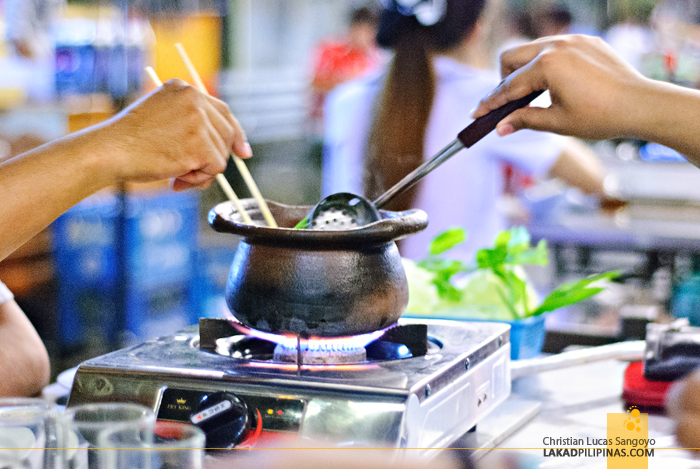 We visited one such restaurant for dinner, the A-Roi Jumzapp (99.00 Baht per person, the cheapest hot pot in Chiang Mai), after visiting Wat Chedi Luang. It was relatively close to the temple, relative being the keyword here. But our walk did not go in vain. We were starving by the time we reached the hot pot restaurant and was ready for an all out buffet food war. To be honest, this was my first time to try a hot pot session, so I don’t really know if the Thais do it differently. 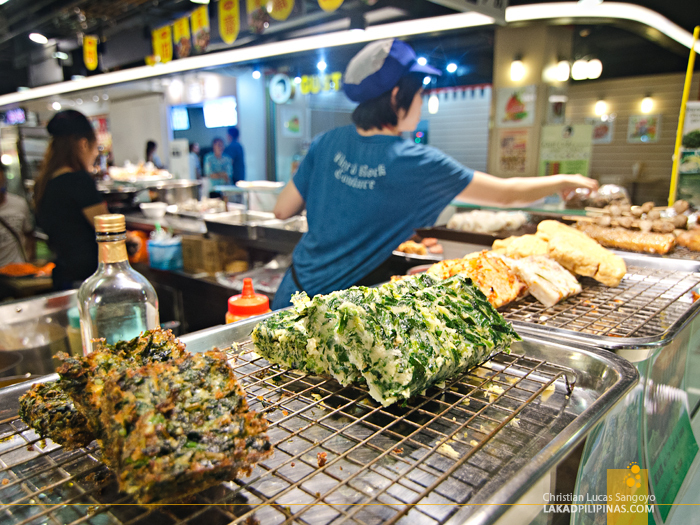 Seeing the greens, noodles, dimsums, tofus and assortments of uncooked meat got my head spinning. I really have no idea what to do, so I simply piled everything I saw on my plate and headed for our table to cook them. Sampling the steaming broth on our clay pot, I found it to be a bit too bland. I voiced out my very valid concern to my companions, what this soup really need is a generous pouring of patis or fish sauce. Maybe they have one in 7-Eleven? I hazarded a question. 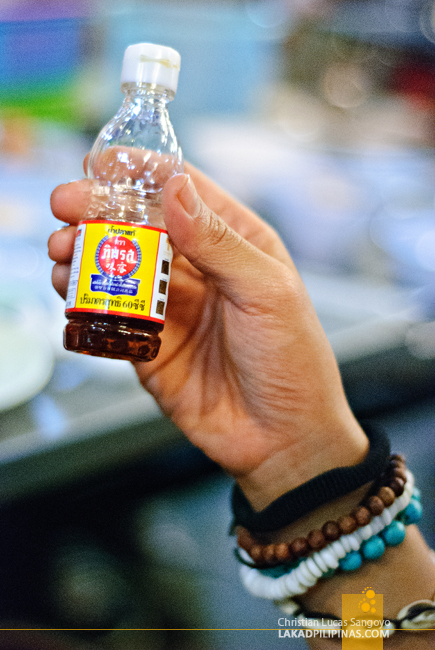 And surprisingly, they do have fish sauce at 7-Eleven! For 6.00 Baht, we got a small bottle of Tiparos. 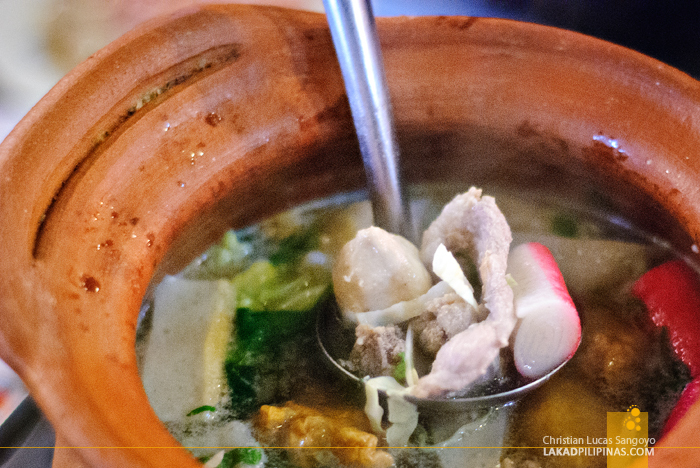 After putting a bit on our pot, the taste transformed to something palatably close to our Filipino nilaga! Everything was good after that. You just can’t go wrong with patis, lol! 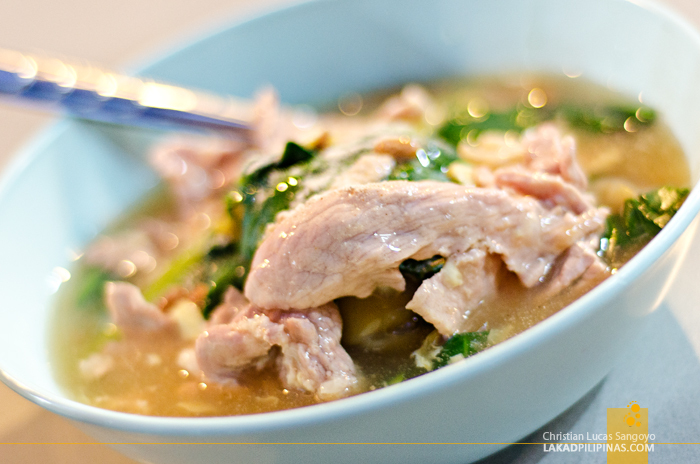 With a little bit of work, Chiang Mai food made us miss our very own Filipino dishes a little less.